If your kids have outgrown your current swing set, and you want to trade it in for a bigger, sturdier model, one they can enjoy for the next several years, you’ve come to the right place: here are showcases of 10 of the best heavy duty swing sets for older kids available online. Having the right swing set can help your big kids want to stay active and spend many hours outdoors. I’ll show you what you need to consider when making your choice, after you’ll see my top picks for the year. I’m sure by the time you’re done reading you’ll see a heavy duty swing set that you and your big kids will love. Will they will be safe using it? Will they will still find it entertaining? 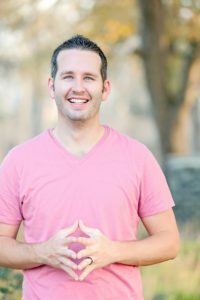 Safety: Will my big kids be safe using it? Compared to toddlers, bigger kids weigh more when they swing, slide, and hang, and have more impact when they jump and land. This is pretty much just common sense. But it does mean you need to have a swing set designed to handle such weight. Thick beams (especially the swing bar), bases that can be anchored properly (where applicable), heavy duty brackets, extra sturdy plastic… if you look at a swing set and right away think to yourself “that sorta looks flimsy”, you’re probably right. A solid swing set must LOOK solid to start. 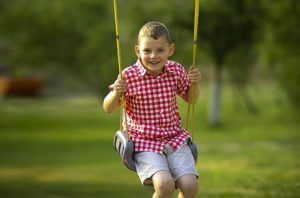 There are 2 main types of swing sets you can look at if you’re aiming to buy a heavy duty playset for your kids: Metal and Wooden. Below you’ll find the top 5 recommendations for each, so go with your preference. 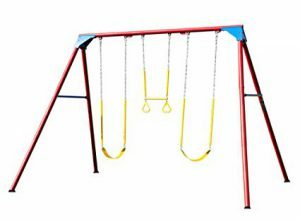 Metal: Metal swing sets are constructed from steel and are extremely long lasting, heavy duty and normally have a much higher weight capacity than wood (so you moms and dads can also swing, for example). 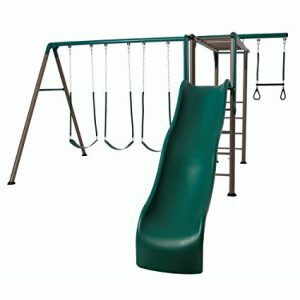 Often you can get steel swing sets in a variety of colors as well. 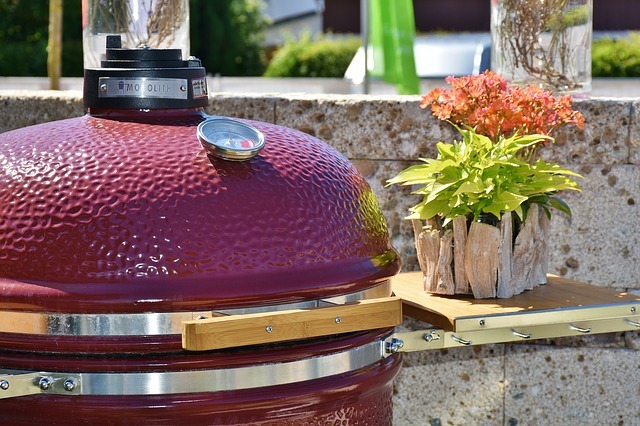 The steel is usually finished with a powder coating to prevent rusting and heat retention, so they are safe for play even in the hot summer, and they’ll stay looking nice for years to come. Maintaining a metal swing set usually just means touching up scratches with paint on occasion to prevent rusting… that’s it. 2. Entertainment Value: Will my big kids ENJOY playing on it? You know your kids best, so you’ll know best what they in particular would like. However, watch any group of older kids at a playground, and what do they gravitate towards? Monkey bars, especially ones they can get up on top of. GOOD swings, with the swing beam at a nice height (a small/low set of swings and a small, slow slide are often what makes kids outgrow their first swing sets. 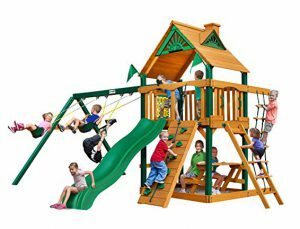 A “fortress” or “clubhouse” area where they can sit and chat between games of tag, especially ones that have interesting features such as a captain’s wheel or spy glass, crow’s nest, chalkboard, sandbox, picnic table, or other things that inspire creative play. Now let’s take a look at my top picks for 2019. First, the top 5 METAL options, then the top 5 WOODEN ones. This heavy duty metal swing set by Lifetime is my top recommendation for older kids. 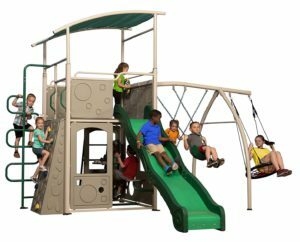 It’s has a seriously high fun factor with all of the activities they have packed on this unit, it’s solid, and is built to last, well, a lifetime! 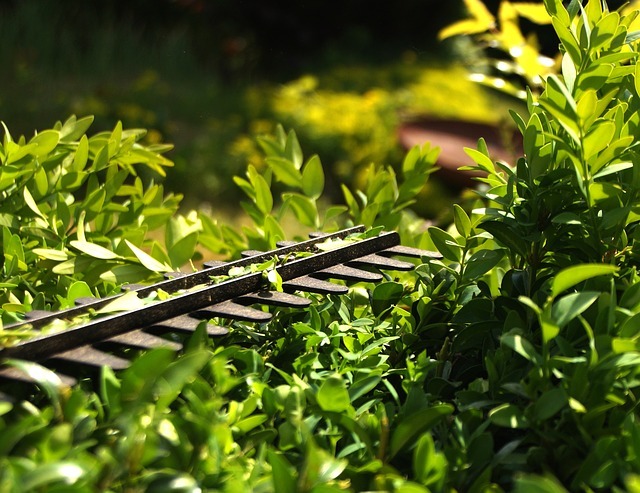 It’s heavy duty steel construction, sized for and aimed at kids aged 3-12, and is FREE STANDING. 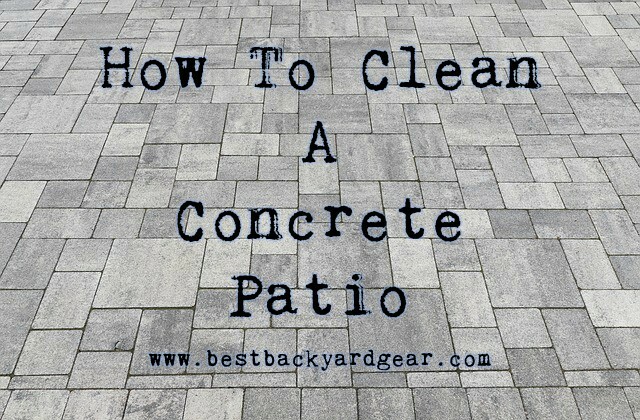 Yes, that means it does not need to be cemented into the ground, but it’ll handle all sorts of wild play without moving around. Reviewers claim that even adults can swing on it without it budging! It comes with a 9 foot wavy slide, 2 swings, 1 rubberized trapeze bar with rings, a 3D climbing wall (climb either side), a cargo net, propeller/standing swing (underneath), a captain’s wheel, a ladder, and an activity board… plenty to keep your kids busy for hours! It’s built from high quality materials that are durable, weather-resistant, and rust-resistant, and that are designed not to warp, rot, crack, or splinter (like all wooden ones will, eventually). What that means for you is that you have ZERO maintenance that you’ll need to do on this set over the years! There’s a 5 year limited warranty from the manufacturer, so you can trust that your purchase will be able to be enjoyed for a long time! Here we have another metal swing set from Lifetime Products that is great for older kids. It’s somewhat simpler than the above model, but if you’re looking for a basic swing set with a few fun twists, this one is well worth a look! 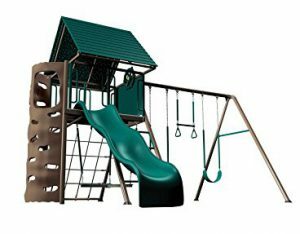 It includes 3 swings (with adjustable heights), 1 trapeze bar with rings, monkey bars, and a 9′ wavy slide… enough to entertain even older kids! Even though it’s freestanding (meaning you don’t have to cement or anchor it down), it’s extremely sturdy, built with an official max capacity of 640lbs! Like the “Big Stuff” model featured above, the frame is rust and weather resistant, built to last for years! Lifetime Products is known for its quality customer service, even sending out touch-up paint by request… their manufacturers 5 year warranty ensures you’ll be happy with your swing set for years to come. I wouldn’t consider the Lifetime Monkey Bar Adventure Swing Set cheap, but you don’t want a cheap swing set if you’re truly looking for something heavy duty, something your older kids will be safe playing on. Cheap is just going to lead to issues and a miserable time. You want to make sure you’re getting quality and that’s exactly what you’ll get here. What customers love about this swing set is the seriously huge range of activities for kids – it’s a swing set whose attraction will remain for kids well into their teenaged years! The clubhouse (5′ off the ground) comes complete with a rigid hardtop roof with an impact resistant skylight, a sandbox area, 4 storefronts for make believe play, 2 doors, chalkboards, a captain’s wheel, and a car map. With all of these features, it is designed to hold up to 10 players (ages 3-12) at a time! 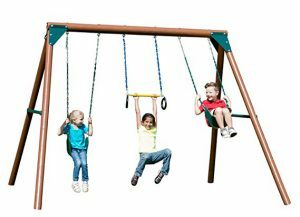 The materials for this swing set are top quality: UV resistant, and will not crack, warp, rot, splinter, or require ANY maintenance on your part over the years! Like the other swing sets, the Adventure Tower Deluxe also has a 5 year limited warranty. You can also purchase this model without the monkey bar section for a lower price (it’s simply called the Adventure Tower). This is one large and serious playground/swing set for older kids. It’ll take up a lot of space in your yard (the unit is approx. 16′ x 16′, and then you need a safety zone), but if you have the room, and can fit the hefty price tag for this fabulous swing set into your budget, your kids are going to be pretty excited! Check it out in the video here! This swing set by Backyard Discovery is their entry into the metal swing sets world – they generally do wooden ones (and they do them well). This swing set aimed at kids aged 3-10 has plenty of activities that will keep your big kids busy playing! It comes with 2 swings plus a web swing, a slide, climbing ladder, steering wheel, a built in playhouse underneath, a rock wall/climbing wall, tic-tac-toe game table, overhead shade canopy, a metal climbing tree, and more! Backyard Discovery has been making swing sets for over 30 years, so they know what they are doing… and when they say this one is made from heavy duty components, you can bet it’s solid! 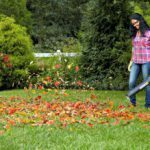 It’s also made from weather-resistant and rust-resistant materials, so you can trust it’ll look great for many years (even with pretty much ZERO maintenance on your part)! This is a great swing set to consider especially if you’re a bit tighter on space – it doesn’t have a huge footprint compared to some of the Lifetime metal swing sets. It’s well priced, well built, and a great option for a heavy duty swing set for older kids… worth a closer look. Here’s a bit of a different option for those of you looking for a heavy duty swing set… this one is just the swings part (and a trapeze bar with gym rings). It’s pretty much the best option you can get for some heavy duty swings apart from buying a commercial set like they have at the public parks, and the reviews on it are incredibly positive! 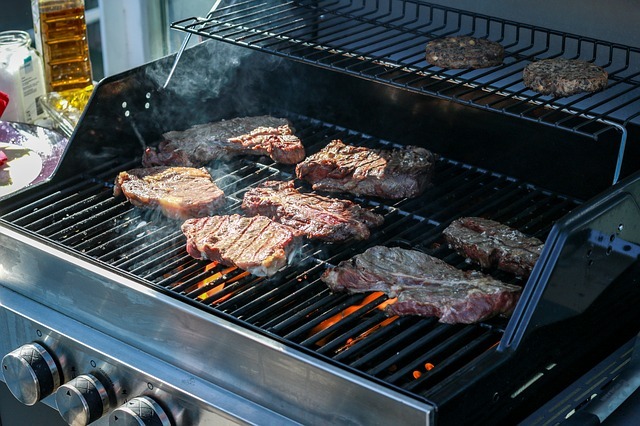 It’s WELL BUILT, made of all-weather high strength low alloy steel that won’t crack, chip, fade, rot, warp, or peel (meaning you’ve got something that will really last)! It’s FREE STANDING, so you won’t have to cement or anchor it in (unless you chose to, but reviewers say it is just fine anchor-free). It’s backed by a 5 year limited warranty, so your investment is definitely well protected. The above 5 options were all heavy duty metal swing sets – the next ones featured are built from wood. 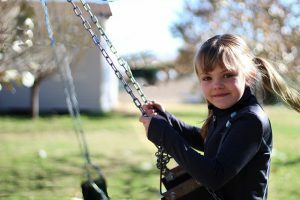 If a wooden swing set appeals to you and your family, here are 4 of my top recommendations for heavy duty swing set options that older kids will enjoy. 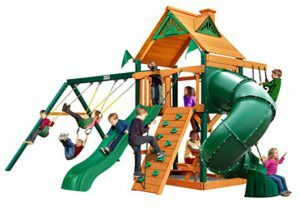 Gorilla Playsets is one of the “big names” in “big play sets”. They sell the big monster ones that look like they belong in a public park or school playground, but also great backyard options like this one! 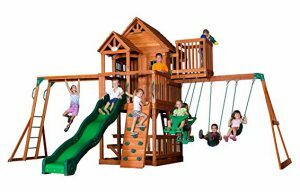 The Chateau Cedar playset is a good one for bigger kids if you have a yard that requires a smaller swing set – it doesn’t have a huge footprint. It comes with all sorts of activities that kids will like, including 2 belt swings, a trapeze bar, climbing wall, rope ladder, vertical ladder, picnic table, playhouse, and of course the wave slide. It’s designed for kids aged 3-11, with a total weight capacity of 800lbs! 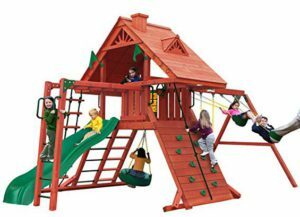 he heavy-duty solid 4 x 4 wood framing and 4 x 6 swing beam allow the swing set to have a total weight capacity of 800 lbs. Gorilla Playsets’ cedar is naturally resists rot, decay, and insect damage… and is built from heavy duty, solid 4×4 frames (swing beam is 4×6). This is a great option for a smaller, yet still heavy duty wooden swing set. Why not show it to your kids and see what they think? 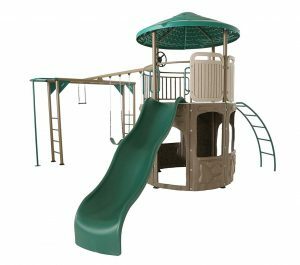 If you’re looking for a wooden playset that has some fun features that older kids like, this “Sun Palace Cedar II” is one to consider for sure! Older kids love monkey bars, rock walls, ladders, a tire swing, and of course, slide, swings & trapeze bar. Add a “tic-tac-toe” game, a telescope and a captain’s wheel in the 4×6′ playhouse, and there’s enough here to entertain them for quite some time! You won’t have the same swing set as everyone else you know… very few wooden swing sets come in this beautiful redwood stain! It’s a decent size, so you’ll need a fairly large yard for it. Assembled dimensions are 21 ft. W x 12 ft. D x 12 ft. H. The recommended safety zone adds a 6ft. perimeter around it, which brings the total recommended footprint to 33’W x 24’D. This is not a cheap set; it’s one of the priciest on this list. But you don’t necessarily want to go cheap if you’re looking for something solid that will put up with the busy and excited play of a group of bigger kids. Gorilla Playsets (sold by Swing-N-Slide) are known for excellent quality and for fun… it is worth a closer look, I think. Backyard Discovery made it onto this list already with a great metal swing set or older kids… this one here is one of their many offerings in the wooden swing set line – and I think this one is a great option if you’re looking for older kids as it has all sorts of attractive features they’ll love. The Skyfort II is one of Backyard Discovery’s best-selling swing sets – and as it’s made with beautiful 100% cedar that’s lab-tested and proven to be rot-resistant and durable, those who pick this one up won’t be disappointed and find they need another swing set in just a few years time. It’s solid too – and the brackets are heavy duty. 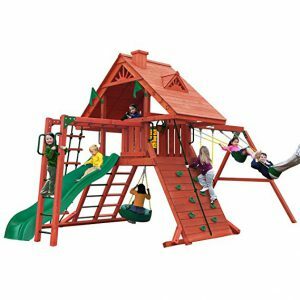 Reviewers say this swing set is relatively easy to put together once you get the “thousands of pieces” in order – thankfully the wood is pre-cut and stamped with the part number, but like all big swing sets, putting it together is a big job – although worth it in the end. If you liked the metal “just swings” swing set idea above but weren’t too excited about the price tag on the “Lifetime” one, you WILL like this one! The swing bar comes in at 8′ tall, so it’s a good height for a backyard swing set. The trapeze bar and swings have a max weight capacity of 115lbs each. Although it’s not made for the same durable steel as the Lifetime swings above, the wood posts are surprisingly guaranteed, maintenance free, for 5 years! It goes up nice and quickly – no fussing around with hundreds of parts! Less fuss, less stress! Yes, it does come with anchors to attach it to the ground. The Orbiter Swing Set is a great option if your kids need a swing set but you don’t have a big space (see more top quality small swing sets). It’s simple, but will do the trick. Another entry here by Gorilla Playsets; this one here is the Mountaineer , and it’s great for bigger kids, with an age suggestion of 3-11, and a weight capacity of 800lbs! That means a big troup of kids can enjoy this swing set all together, and safely! Reviwers claim this swing set is very sturdy, which makes sense as it’s make with heavy-duty solid 4 x 4 wood framing and has a 4 x 6 swing beam. Has TONS of activities packed into a fairly small footprint, including 2 slides, 2 swings plus a trapeze bar with rings, a rock wall with climbing rope, a rope net, a picnic table area, fortress/clubhouse with steering wheel, telescope, and tic-tac-toe game, and more! Is made from premium cedar, pre-cut, pre-sanded, pre-stained, and ready to assemble & impress! A solid roof, which gives it that “real fort” feel/look, and also lasts a LOT longer than a tarp or canvas roof. It’s available from a variety of places, but the deal on Amazon is pretty great at time of writing, including free shipping. Your children would be pretty excited about this one… don’t believe me? Show them the pic and see what they think! Excited to see your big kids having a blast in your back yard this summer? A heavy duty swing set for older kids is exactly what you need to get your toddlers-no-longer outside and active. Any of these metal swing sets or wooden swing sets will be great choices, so check out the ones that catch your eye, and get ready to have some “fun” assembling them! Actually, the real fun will be watching your children enjoy it!